1) How to determine if you have sufficient space for a dart throw area. 2) How to properly hang a dartboard. 3) How to set-up an attractive throw area with sufficient lighting on the dartboard. 4) How to do this as as cost efficiently as possible. We at DT are always happy to answer questions from either a bar owner or an individual about setting up a dartboard. Although the consideration here is geared more toward Thailand bars and pubs which tend to be much smaller than in the West - all this information is applicable anywhere. Veteran dart players as well as pub owners who've been in the game a while know all this as common knowledge. But to someone who has never set up a dartboard there is a lot more to consider than just the instructions included with your dartboard on how to hang it on the wall at the required proper measurements. We hope that you find this information useful and successfully add a dartboard to your establishment. The graphic (to scale) - right - of Ned's darts setup with customized light box is from The Silver Dollar Bar. Most of the photos of this throw area in the gallery accompanying this segment are also from The Silver Dollar Bar. So then, the Silver Dollar is a really popular & happening Bangkok darts bar? Yes - it was. Was? Yes, sadly the Silver along with seven other dart bars in Washington Square no longer exist. The Square in now flattened eventually to become yet another empty Bangkok mega shopping mall. The first thing to consider - Do you have sufficient space for a dartboard throw area? Obviously the dartboard itself takes little space - hangs on the wall like a picture. And in some places - without sufficient throw area space - their dartboard in nothing more than a decoration - seldom if ever used. Cheap kiddie dartboards are a far cheaper wall decoration than a real dartboard. So how much space do you need for a proper throw area? A floor space area ten feet from the dartboard wall that is six feet wide. What - that much? Well consider that the player standing at the oche or throw line is 7' 9 1/4'' from the front of the dartboard needing an unobstructed space in which to throw as well as an unobstructed sight view of the dartboard. The top view illustration - left - shows the needed space. Another consideration especially relevant some places here in Thailand is a high enough ceiling. Many pubs are in shop houses and double wide shop houses with really high ceilings but renovate these into two floors to maximum their capacity. The ceiling height in these areas are then less than standard height. A dart throw area should have a minimum ceiling height of at least eight foot. Remember a dart thrown at the board has a high arch some players with a really high arch. And a person six foot tall can stretch to reach an eight foot high ceiling. regular, every day players - and most especially new players - as a dartboard within sight of the popular congregating spot in the bar. You may have no choice but if you do - placing your dart throw area in the correct location in your bar could be the difference of just having a dartboard or becoming a popular dart bar. One more point to consider is fan and air-condition breeze. If breeze is a factor in golf - just think how much more a factor with darts - having a flight or feathers section. Your dart throw area needs to be out of any breeze area. If you have any doubt about this - try pointing a fan in the direction of the dart throw area and then try throwing some darts. Not only will you be convinced but may be amazed at just how much a slight breeze can totally alter the trajectory of a dart. in the diagram left. A dartboard must be hung properly - correct measurement from the center of the bullseye to the floor with the oche or throw line at proper distance and have sufficient lighting. A dartboard will come with a bracket to be affixed to the wall or your back board - a set-screw to go in the center of the dartboard - on back in the pre-drilled hole - and three bumpers compensating for the set-screw. REMEMBER - the 7' 9 1/4" oche measurement is NOT FROM THE WALL but from the front of the board. Using both this measurement and the diagonal 9' 7 1/2" measurement from the center of the bullseye to the oche will insure that you get it right. The first step is affixing the dartboard bracket. Insure that your pencil mark on the wall or backboard is 5' 8" from the floor. The set-screw in the back of the dartboard is then fitted into the slot of the bracket. The reason for this style bracket is so that the dartboard can be regularly rotated for even wear. Regularly rotating the dartboard is most important especially in bars where the patrons play a lot of 501 as the triple 20 area will be thrown at much more than other areas. Rotating the dartboard on a regular basis can easily double or triple its lifespan. Just how often depends on the amount of play on the dartboard. In my regular darts pub with a good amount of play it's rotated once a week. A footnote to nubiles - the numbers "ring" snaps on and off when you rotate the dartboard. Now as all new dartboards come with a perfectly functional bracket and hardware to hold the dartboard exactly in the manner it was designed to do - why then would I want to even consider spending additional money for a dartboard clamp? Seems a logical enough assumption but in the long run the clamp will actually save you money and avoid increasing levels of annoyance and irritation. Trying to find the slot in the bracket while holding a dartboard with the set-screw in the back can be a real sobriety test. Additionally the more you do this the more wear and tear on the bracket. The bracket is fairly light gauge and will begin to loose shape and bend out. You can't keep replacing it with the cheaper brackets as the screw holes will also wear. Done right from the get-go with a dartboard clamp will avoid all this. There are different dartboard clamps on the market but the one above is the one I personally prefer. 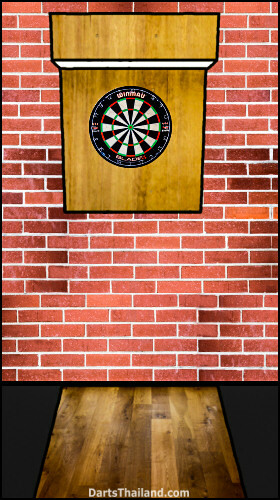 A Dartboard must have sufficient lighting - defined as no shadows cast from a dart thrown in the board. Using conventional lighting this can be a real challenge as two spotlights properly positioned are usually needed to get it right. And getting the lighting right is an on-going nightmare for some venues. Ned's backboard and light hood is spot on and with only one florescent bulb in the hood. This has to be the cheapest set-up to make as well as being the most efficient. The trick of why this works is the depth of the hood. Many put up a hood far too shallow that then causes shadows. Ned's design has a hood 13 1/2'' deep. The inside is painted white and the florescent bulb fixture is mounted to the far front of the hood - dispersing the light over the board with no shadows on darts in the board. The inside of the hood has room for mirrors to further intensify the light if needed of even additional spot lights. The outside hood and backboard can be stained or painted any color to best suit your bar. Also the outside front of the hood is a great place for your bar's name. This is the basic design - functional - easy to construct as well as inexpensive. How fancy you make it look is up to your own creativity. Lastly - the throw lane area & the oche or throw line. Ideally a raised oche is the preferred standard. Although this is not always possible - here's an idea to consider. As seen in the first diagram and in the below photo gallery - Ned used a 3/8' thick section of plywood affixed to the floor to cover both the throw lane and serve as a raised oche that you could toe up against. Surprisingly few if any tripped on it and that's saying a lot considering the clientele the Silver Dollar Bar had. Most commonly used for the throw lane area is either a mat or carpet and again minimum or two foot in width (no maximum on the width). This could come right up to the oche line and serve as the oche or go beyond the oche line - where the player stands and the also serves as a visual aid to people where not to stand when a player is throwing. And again - although a line to mark the oche is sufficient - a raised oche is preferred. Is a throw lane mat absolutely necessary? Depends on your floor - if it's wood or carpeted - no only a oche is. But if you have a hard surface floor such as tile or concrete - yes a floor mat is most definitely necessary - and the more area it covers - the better. So why is the surface of the floor area below the board so critical? Quality darts today have a hard metal barrel (body) using metals like tungsten for more weight and a thinner dart. Although strong they are also brittle and if they drop or bounce out of the board and hit a floor surface like tile or concrete in just the right way - they can shatter. Additionally have as sharpening stone available as players will be happy to use it when they get a burr on their dart tip. Stones are cheap and removing burrs from dart tips will prolong the lifespan of your dartboard.